You can use your iPhone as an external USB flash drive using this (currently) free software from myPodApps. 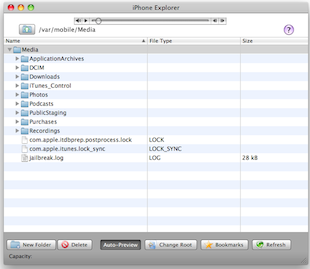 Called iPhone Explorer, it’s a simple and lightweight program that lets you browse through your iPhone through it’s interface which works pretty well as a file manager. You can rename, create, delete, drag and drop, both files and folders on the iPhone using this app. At the time of this writing, iPhone Explorer was a free download for Mac OS X and Windows, but based on our past experience covering software by the authoring company, myPod Apps, this could change at any time. So if you want to use your iPhone as a flash drive and want to do it for free, I suggest downloading this now or it might go the same pay model as PodToMac when we discussed getting music off your ipod.